The Zoku Round Pop Molds have a silicone mold that rests in a plastic base which does not touch the popsicle ingredients. The stick is plastic though (PVC, BPA, and Phthalate free). A solution to this would be to buy your own sticks (made from bamboo or something). I felt ok about it because it wasn't that much plastic, so I compromised a little from what my ideal was. The round shape is unique! A bit harder to fit the whole popsicle in the mouth, but nevertheless fun to eat. The silicone is nice because it just peels right off, very smooth and no running the popsicle under water to loosen. Fill line indicators make it easy to know how much to put in. For this popsicle, I filled the mold with a smoothie I had made (milk, frozen bananas, frozen mango, and blueberries). It came out very soft and creamy, not too icy. Delicious. 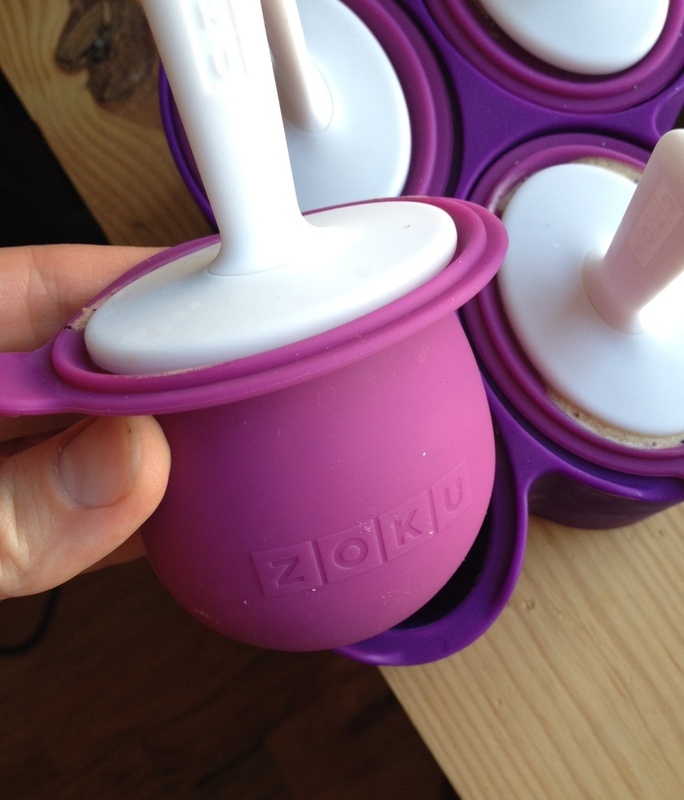 Zoku has a lot of other products that seem great, but they do have many products that are made out of plastic. I think these popsicle molds work great, but if 100% plastic free is your goal, then you might need to look elsewhere. Life Without Plastic has a popsicle mold that has NO plastic whatsoever, called the Freezycup. It is made from high quality food grade stainless steel that is BPA, Lead, Phthalate free and tested in a third party accredited laboratory to ensure compliance with the US Consumer Product Safety Improvement Act. The sticks are reusable and made from bamboo and there is a small silicone part that holds the stick in the drip catcher. This mold does require to run it under water just for a few seconds in order to release the mold. The pops are sold individually and can be squeezed in numerous places in your freezer. They also sell a wooden or stainless steel stand that hold four pops. The narrowness does make it easy to pop the pop in your mouth. The orange silicone bit that holds the stick in place inside the drip catcher can be seen below. I mixed pineapple with coconut milk and a little lime for this recipe. It was good, but I need to work on it a bit! Life Without Plastic has many products made out of stainless steel and seems like a great company and resource for people who are concerned about toxins in products!